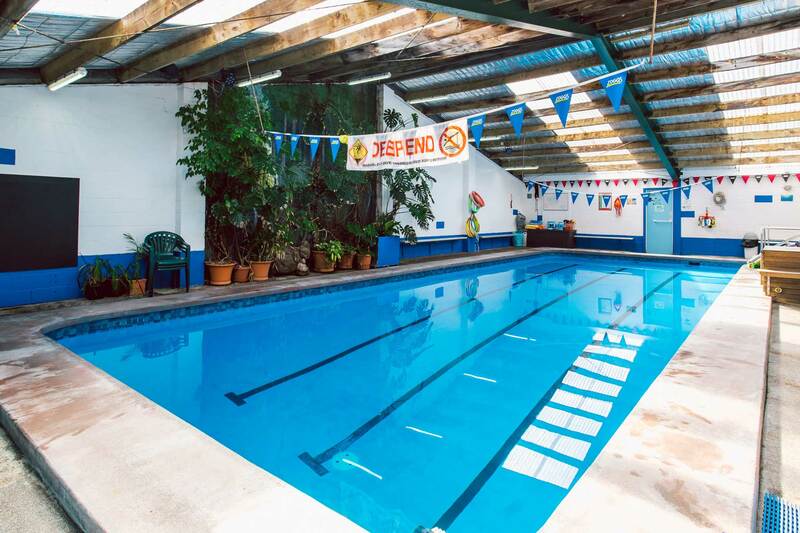 Our small pool is a friendly 6m x 4m with a maximum depth of 90cm. Beautifully warm at 32 degrees and is a SALT WATER pool. This means for you less irritation of eyes and skin and softer water over all. For us, it means less build up of calcium hardness in the water, better quality water AND happier customers. 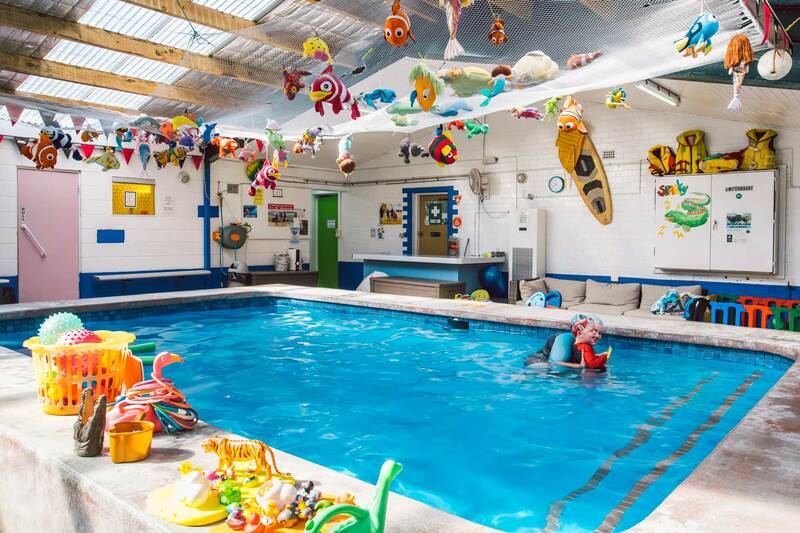 Your kids will love this pool and so will you. It’s shallow enough for pre-schoolers to walk around, thus increasing their confidence, but it’s deep enough to swim! We replace the water in this pool every 12 months – so you know it’s safe and clean for you and your children. Our 13 x 5m Pool ranges in depth from 1m to 2m in the deep end. This pool is also SALT-WATER and is tested and balanced several times each day. The pool is emptied every twelve months and fresh water brought in – thus keeping the hardness levels down and reducing allergic reactions and itching that can irritate swimmers. This pool is run at 30 degrees all year round. We have three very different change rooms available for you to use. All change rooms are heated and have seating, showers and wall mounted Change Tables. Read through to decide which is the best change room for you and your family. Behind the PINK door we have our Ladies Change Room – there’s a shower, separate toilet, loads of seating and hooks AND a wall mounted Change Table. You will also find both a Nappy and Sanitary Disposal bins. There’s an exhaust fan to take away the steam from the shower and a heater to keep the room warm in Winter. PLEASE NOTE: No school-aged boys permitted. Behind the BLUE door you will find the Men’s Change Room. There’s a shower, a urinal, a separate toilet, seating and hooks and, right up the far end, Dads with small children will find an annexe just for them. In the annexe there is a change table, a potty, a Nappy Disposal Bin and just enough privacy! 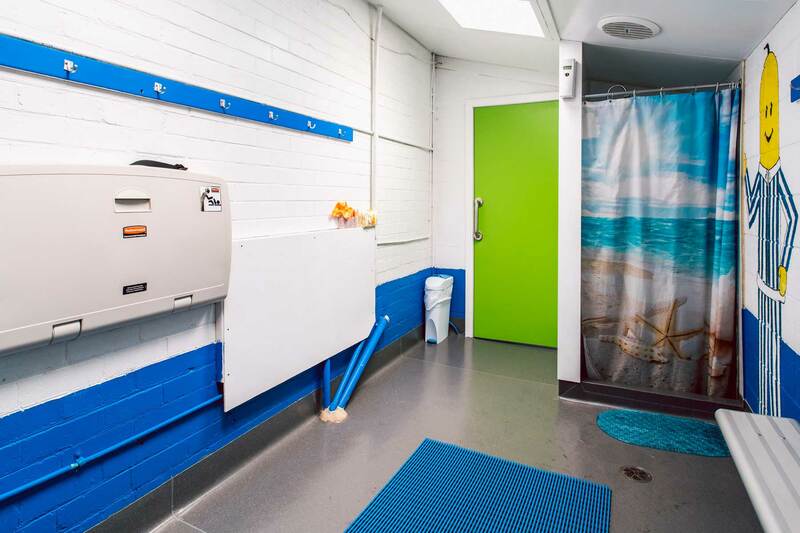 The Men’s Change Room is heated through the colder months and the shower is always warm. PLEASE NOTE: No Mums permitted. Down past the couches near the small pool behind a GREEN door is our Gender Neutral Assisted Change Room. This room is for parents to take children (under 8) who need assistance with dressing and can not be taken to their gender specific changeroom. There are several change tables, a potty, a shower, a playpen and a Nappy Disposal Bin. This room is kept toasty warm when it’s chilly outside and there’s plenty of room for parents and children. PLEASE NOTE: Parents are advised not to get changed themselves in this room as it is Gender Neutral and open to both Mums and Dads.